There are lots of big, long term things you can do to impact your marketing, but there’s also small fixes and habit changes that can positively impact your effectiveness. Implement these 5 things today and it can increase your productivity, traffic to your website and streamline your work flow. 1) Always reread your email before you click send. This seems basic, but lots of people don’t do it. It may take an extra few seconds to skim and reread, but it’s faster than having to undo a miscommunication. Whether you are interacting with a resident, a prospect or a manager above you, it’s important to communicate clearly and simply – and ideally with as few errors as possible. Of course, some minor spelling errors can be overlooked, but sometimes a small typo can change meaning, so take 1 minute and reread before you send. 2) Put your community web address in your email signature. Again, this seems basic, but unfortunately, it’s often overlooked. Whether you are communicating with prospects or current residents, your website should have content that is valuable for both. Always make it as easy as possible for people to get to your website and share your website. Ideally, it has great photos of your community and has all types of current information about prices, community events and even a Frequently Asked Questions. To a co-worker or regional manager: “Do you have the new photos from the photographer? If not, when can we expect them? 4) Keep your message focused. Big blocks of text are hard to read or digest easily. Again, whether you are communicating with residents, prospects or internally with someone you manager or who manages you, keep the point of your message clear. Make the subject line specific to the information or action needed. Use bullet points whenever possible. Add space between paragraphs. Don’t use vague phrases that will require the recipient to email you and ask more questions before they can take action. For example saying “the washing machine isn’t working” doesn’t give enough information. That ends up requiring another round of emails back and forth to understand the specifics of what isn’t working, what happened when you tried it and what you need to solve the problem. 5) Take action & organize next steps. 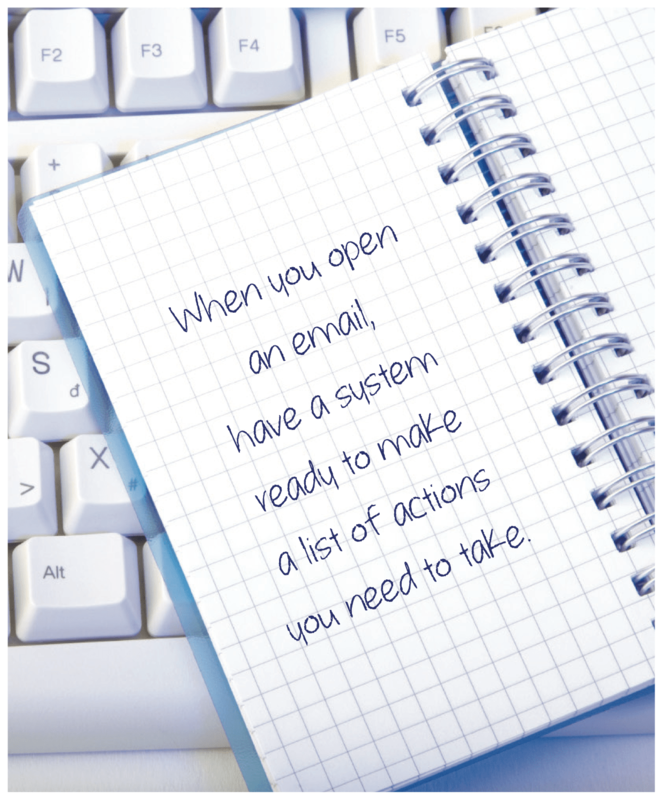 When you open an email, have a system ready to make a list of actions you need to take. Whether it’s digital or just paper and pen, be ready to organize and keep track of things you need to do based on your emails. If it makes sense for your responsibilities, make separate lists based on type of action. For example, list all vendor-related actions in one column, all actions to delegate in another column, and resident related actions in another column, etc. You may want to order your tasks by priority or deadlines. Approach your inbox as a task list, instead of a chaotic monster. Reply immediately if you can, and if not, write down a clear action you need to take to be able to follow-up or complete a request. This will help you reduce the chaos in your office and help you stay on top of resident requests. And of course when residents have their needs met and don’t have to keep bothering you until something gets done, they stay happier and they stay in your community. Using email effectively and improving your communication skills is good for your career, can reduce wasted time and can make it easier for you and your staff to work together and serve your residents. Implement these simple tips today and experience immediate improvements in your productivity and work flow, while also possibly drawing more traffic to your website. It’s a win/win all around. Do you have additional tips and tricks you use to tame your email inbox? Let me know in the comments below. 33 Awesome Apartment Marketing Ideas Found On Pinterest. Wait To You See #6. Copyright © 2019 Resident360, All Rights Reserved.